Today at Frankfurt airport, a knife was discovered on my hand baggage by the scanner machine. 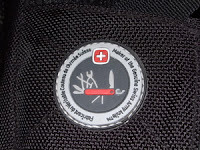 The offense was caused by one of the patches on my logo festooned backpack. I wonder whether this would have caused amusement to security staff in other parts of the world?